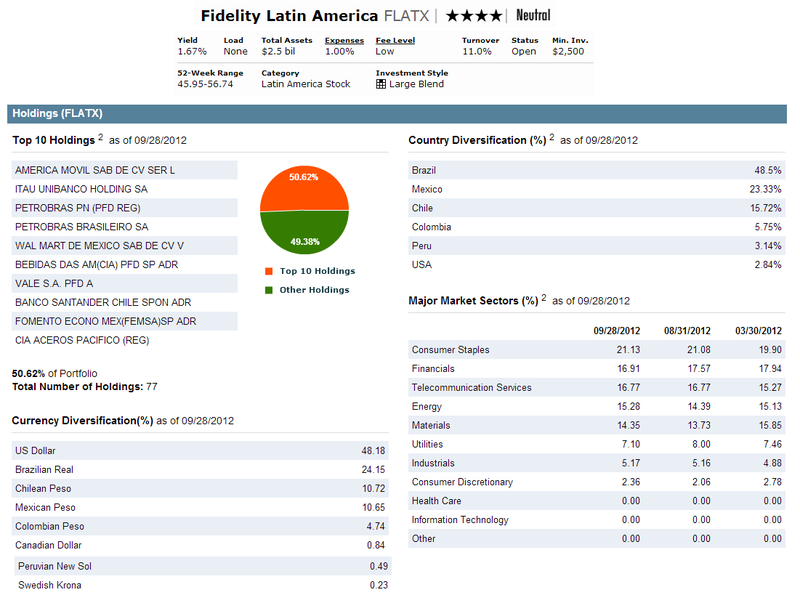 This Fidelity Latin America Fund has total net assets of $2.48 billion. It was first introduced to public in April 1993. Adam Kutas is the current fund manager. He started managing this fund in February 2009. This Latin America Stock fund is a no load fund. The annual expense ratio of this fund is 1.00%. There is no management fee and no front-end sales load fee for investing in it. It also has low annual holdings turnover of 11% as of October 16, 2012. This FLATX fund is available in regular brokerage and retirement account. The minimum initial investment for brokerage account is $2,500 with no minimum subsequent investment. You can buy this mutual fund as low as $500 for your IRA account. There are 74 brokerages that provide the sale of this fund, such as E Trade Financial, Vanguard, T Rowe Price, JP Morgan, Scottrade Load, Vanguard, Schwab Retail, UBS Financial Services Inc, etc. The top 10 holdings of this fund as of September 2012 are America Movil SAB De CV Service L, Itau Unibanco Holding SA, Petrobras PN, Petrobras Brasileiro SA, Wal Mart De Mexico SAB De CV C, Bebidas Das AM(CIA) PFD SP ADR, Vale SA PFD A, Banco Santader Chile Spon ADR, Fomento Econo Mex(femsa) SP ADR and CIA Aceros Pacifico (Reg). This top ten represents 50.62% of the total portfolio. The major market sectors are Consumer Staples (21.14%), Financials (16.91%) and Telecommunication Services (16.77%). According to the fund prospectus, the principal investment risks are stock market volatility risk, foreign exposure risk, Geographic concentration in Latin America risk, Issuer-specific changes risk, etc.